The eighth edition of open air ROLAND JAZZ FESTIVAL is about to take place in Singeorz Bai, Bistrita-Nasaud County, Transylvania,Romania. There will be three days of jazz, workshops, good wine and fine company, all that protected by silent mountains and beautiful people. 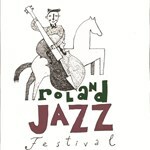 Become a fan of Roland Jazz Festival to hear about new music, videos, event info & special offers.